We switched to Singapore Math for our math curriculum for the younger boys this year. While the textbooks provide everything they need to learn new concepts, I prefer giving them a way to practice until they master each lesson via a worksheet or workbook. 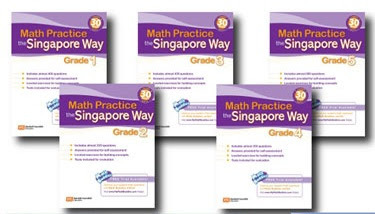 Marshall Cavendish offers a line of affordable workbooks that match up seamlessly with the Singapore Math method, and they are available for grades 1-5. We loved that it was easy to snag a few sheets for the kids to work from in the car or when we had a few extra minutes in the day; the books are available in a "Practice" or "Challenge" workbook for just $12.99 each! My son just wasn't learning his phonics the way I felt he should, so we started him on a new online program called Reading Kingdom. This site is quite a bit different than other sites, in that it is completely customized to my son's learning level and needs. He took a rather long diagnostic test before he even began the program, and we were told right away what he needed to work on before placing him in the right level for him. I frequently get reports on his progress, as well as recommendations for what he might need help with. It is also structured so that a child skips over words that he or she can already read and write (which saves time and keeps my often-bored son from losing motivation.) I also really enjoy that each activity ends with a "success" by auto-correcting and adjusting to teach my child his problem spots. He NEVER feels discouraged, and I can see him progressing through the levels with confidence. Learn more about this exciting new program that can be used alone, or with any curriculum, at the Reading Kingdom website. BONUS: "Like" Reading Kingdom on Facebook for an extra entry! You have until September 2nd at 11:59 pm CST to get your entries in. Two total entries per person, and we will pick one winner at random from all eligible entries. This giveaway is open to U.S. residents ages 18+. See our full rules here. *Samples of some products were received to review. Opinions of all are 100% my own..